Children are welcome at the Casa de Dom Inacio. Children are allowed to participate in the lines and to sit in current with their parent or guardian. However, children being children they many times will be restless in current. If they become disruptive enough to interfere with the work of those around you, the casa staff may ask you to take the child outside. If you are traveling to the casa for yourself or another family member and you want to bring your child you might want to consider an option to take care of your child while you are at the casa. 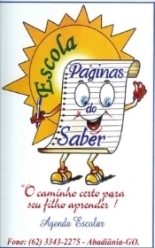 Escola Paginas do Saber - We are an accredited private (Kindergarden through 6th grade) school in Abadiania. We have academic programs for children as well as sports and recreational activities. Our staff is comprised of lincesed professional educators with extensive experience. Our school follows all the directives of the Brazilian Ministry of Education. We offer a Temporary Visiting Student Program for children ages 4 through 7. When participating in this program, your child will spend time in a school environment with local children and will turn their visit to Abadiania into a funfilled and enriching cultural experience. Your child will be matched with a group of kids his or her own age so they can participate with material that is appropriate to them. Program hours are Monday thorugh Friday from 8:00 AM till 11:00 AM and 1:00 PM to 5:00 PM. The morning period will be dedicated to sports or recreational activities and the afternoon session will take place in a classroom setting. We will have an english speaking staff person available to oversee your child's needs. The cost of this program is US$100 per child per week. We require a one week notice to reserve a spot on the program. This program runs during the local school year which is from February through June and August through November. The first day you will be required to fill in some forms and provide copies of documents and name the person or people who will be allowed to pick up your child from the school. We will not release your child to anyone unless we have written authorization from you on file. SEE SOME IMAGES FROM OUR SCHOOL BELOW!! !